Unisharp Yellow needle 30 gauge 13mm 1 2 inch . x 100. Home > Sterile Needles. Multiple sizes. 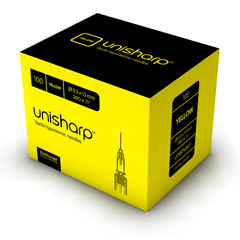 Unisharp Yellow needle: 30 gauge, 13mm (1/2 inch). x 100. Yellow needle: 30 gauge, 13mm (1/2 inch) individually blister packed, luer slip hypodermic needle. A great value, high quality 30 guage needle. Fits all syringes made for detachable needles. The Unisharp 30g is a very fine needle made for injecting under the skin (subcutaneous), can also be used for intravenous injection into small veins.